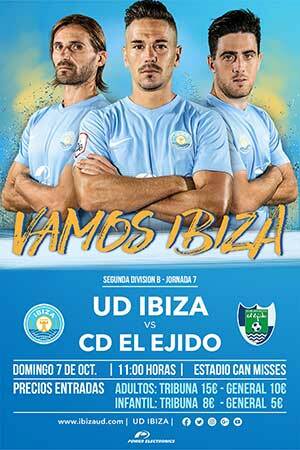 Any articles referenced in the agenda that are not included in the text can be seen in the Ibizan’s October edition. Further details on all markets referenced in the agenda can be seen in our markets guide. A note of caution. All event details are supplied in good faith. Some ongoing events are liable to end in October. Please always check directly with the venue before making plans. 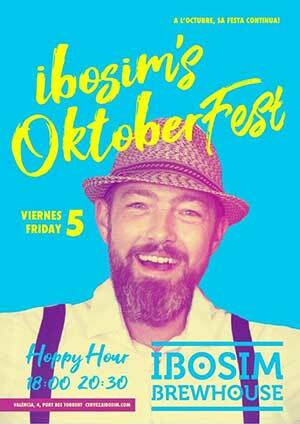 Ibiza’s very own craft brewery Ibosim are celebrating Oktoberfest on Friday with some very special offers. FREE BEER! There, that should have got your attention. The only catch is that you’ll have to turn up in lederhosen to get your free pint. Fear not, if the idea of looking like, well like a bloke in lederhosen, doesn’t sound worth a free pint, you can still get a pint for the price of a half during ‘hoppy hour’, 6.00pm to 8.30pm. 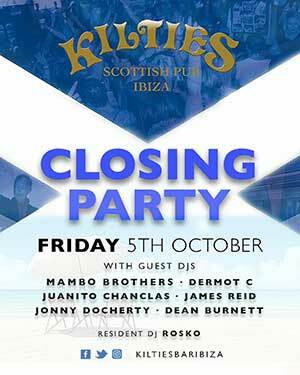 Friday October 5 sees Ibiza’s very own Oktoberfest at the Factory Bar and Smokehouse, organised in conjunction with Ibiza Style. On offer will be Paulaner, traditional German beer and Bavarian delicacies plus fun and entertainment for all the family. The large room and the terrace will be turned into a beer tent and fruit schnapps will be available as well as copious amounts of beer. On the menu will be lots of Bavarian snacks and several hearty dishes. The hors d’oeuvre plate includes meatballs (rissoles) made with fresh obatzda (a Bavarian cheese delicacy and beer garden staple), smoked trout fillet, radishes, gherkins and freshly baked pretzels. No Oktoberfest would be complete without sausages – there will be genuine Weißwürste (white sausages) with sweet mustard, small Nuremberger roast sausages with sauerkraut and authentic Thüringer bratwurst. Munich-style potato salad will also be served. The promised highlights, however, are the suckling pig knuckles and the meat loaf, and for dessert, warm apple strudel with vanilla custard. Then, depending on how you feel, you can either burn these calories off with some sporting fun and games or by taking part in the tug of war, trying your luck at the coconut shy, playing darts, or Schuhplattler dancing on the Oktoberfest grounds beside the marquee. From midday to midnight. Free entrance. 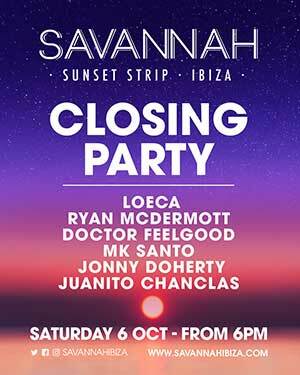 The Ibiza Light Festival returns for its 3rd Ibiza October weekend of October 12 and 13. This 2-day festival is a non-profit cultural event promoted by the Asociación de Artistas y Empresas Audiovisuales de Ibiza and supported by the Consell Insular de Ibiza and Ibiza Town Hall. 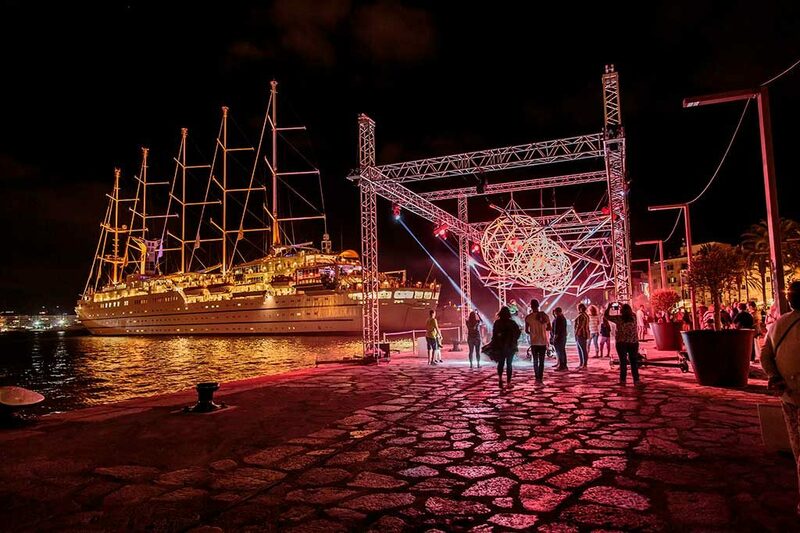 It will bring together local artists and national and international collectives on the island to present an incredible line up of artistic experiences in a unique setting, featuring light in many forms, bringing together technology and innovation with art and creativity. From fire, its most primitive form, to the creativity that today’s technology allows, the festival invites the visitor to explore and be amazed by the creative capabilities of light, promoting dialogue with the island and its historical sites as living entities and cultural symbols. This year will see double the number of installations from last year. There will be video installations, performances, projections and shows throughout the Port of Ibiza, La Marina and Dalt Vila. The public will also be part of the show because there will be interactive installations where the participation of the attendees is required. France, Switzerland, England, Portugal, Italy, Argentina, Russia and Jordan are some of the countries present at Ibiza Light Festival 2018, represented by visual creators such as Richar Santana, El Imaginario, Intrvl AV, Javier Ens and others to be confirmed. Every year this festival gets bigger and better and attracts more visitors. It is becoming one of the main cultural events on the island and a sensational way to end the peak season and brighten up the town as the darker nights of autumn draw in. It will start at darkness falls, about 8pm. 10:30pm— MEDINA AZAHARA in Concert. Andalusian rock!!! 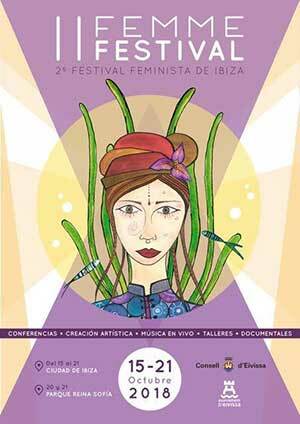 The second feminist ‘Femme Festival’ will run from October 15-21 in Ibiza Town. The programme has not been announced yet, but on the agenda will include conferences, workshops, documentaries, cinema, flamenco, art, live music, health, entrepreneurship and lots more. Keep a look out on their Facebook page for updates. 12.00 – Mass & procession. Followed by Folk dances by Sa Colla de Sant Rafel. “Bunyols” (ibizenco “donuts”) and wine to celebrate. 20.00 – Theatre play:”Sa carai de Caputxeta” (The bloody little red riding hood) by the Grup de Teatre es Cubells. 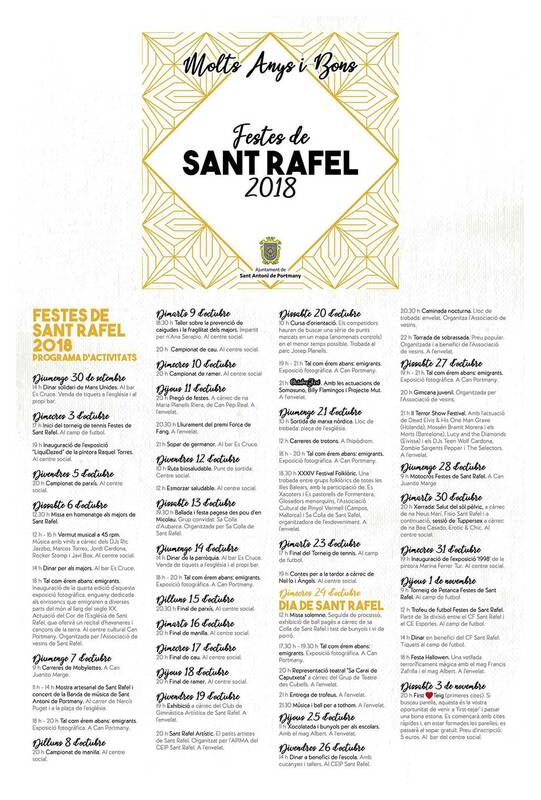 21.00 – Festes de Sant Rafel Award Ceremony, in the tent. In the third edition of the Fira de la Sal, activities for all audiences have been planned, such as children’s workshops, virtual fireworks, exhibitions, a round table on the history of the salt flats and its industry, excursions and guided tours in the Natural Park. 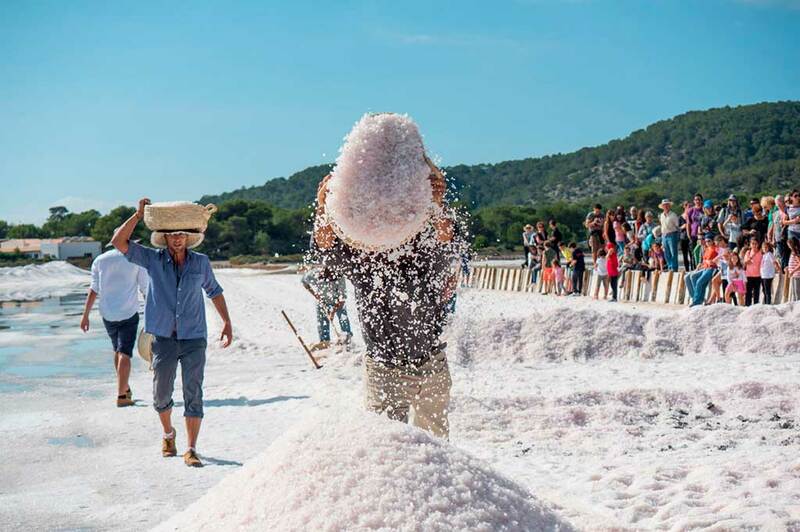 You can learn how the old salineros (salt workers) worked and harvested the salt, one of Ibiza’s most important exports. In Sant Jordi there will be programmed activities such as gastronomic tastings, exhibitions, ball pagès, celebration of the salpassa, and an artisanal and ecological market. in Sant Carlos, from 12 noon—don’t be late as it gets busy! 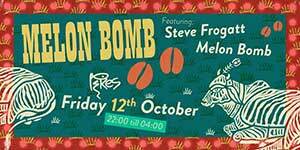 Ibiza October Food Factory @ Sluiz. Enjoy food from a selection of the island’s restaurants and their delicious food from stalls in the gardens of Sluiz. With more than 20 restaurants in one place, live music and entertainment for children. Can Rock is at Carrer des Caló, 2. Bar opens at 8pm, bands usually play around 10pm. All gigs are free and food and drinks prices are reasonable. 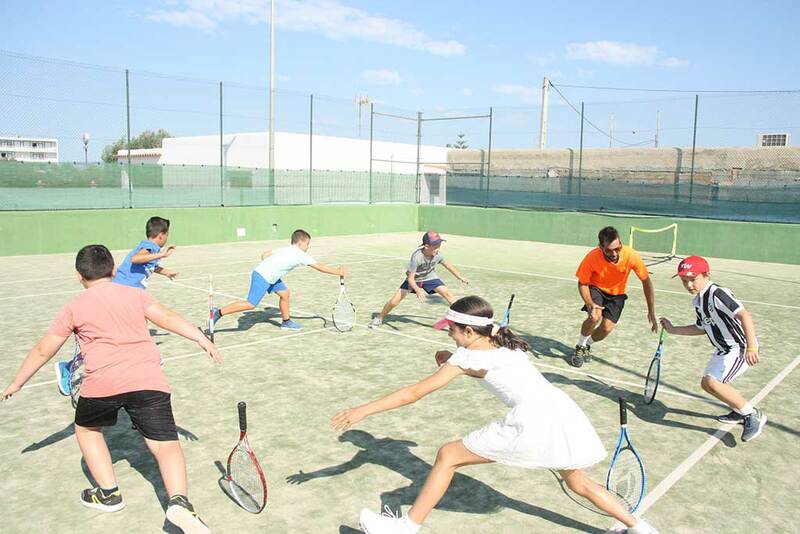 San Antonio’s Viva Tennis have announced the availability of Tennis lessons for children—delivered by their newly arrived multilingual coach. Lessons can be individual, in private groups, or by joining one of the established classes. Viva owners Tom and Edyta are friendly sorts, always keen to help accommodate an individual child’s needs. Get in touch for a chat to discuss the options available. 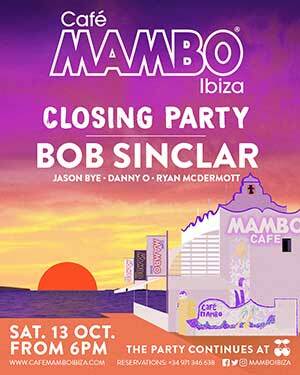 Entering costs €12 and includes all the Ibiza Quills (IQ) membership benefits. Entries will be judged by a panel of experts and there are prizes of €100, €50 and €25, plus Nibs (IQ rewards), goodie baskets and exposure for the winners. Selected entries will be published in Volume 1 of the Ibiza Quills ‘Black & Write’ compilation of words and images of Ibiza. 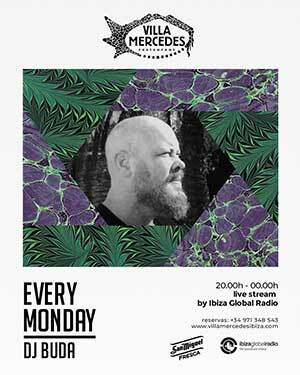 The mission of Ibiza Quills is to nurture creativity, through workshops, writing competitions, talks, wordslams, interesting collaborations, pop-ups, art and poetry. 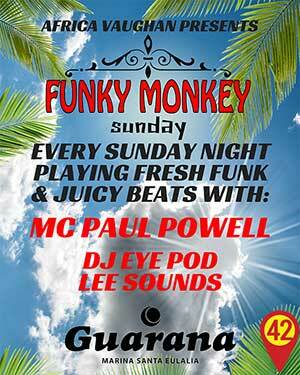 Because they believe that there is more to Ibiza than just music!